Sure, it’s the unofficial end of summer, but we live in Virginia where the summer weather will persist for a few more weeks. We don’t have back to school yet, so there was no getting ready for that either. Still, even though our summer will continue on, we’re starting to feel the transition to fall. There were apples and squash at the farmers’ market this weekend, the nights are cooler, I’ve started knitting again. So before we bid adieu to summer, I wanted to share this vintage photograph I found last week when I was clearing out books from my mom’s house. It came from a book titled Creative Photography which I acquired in high school when my library was weeding its’ collection, but I don’t think I ever really looked through it until a few nights ago. 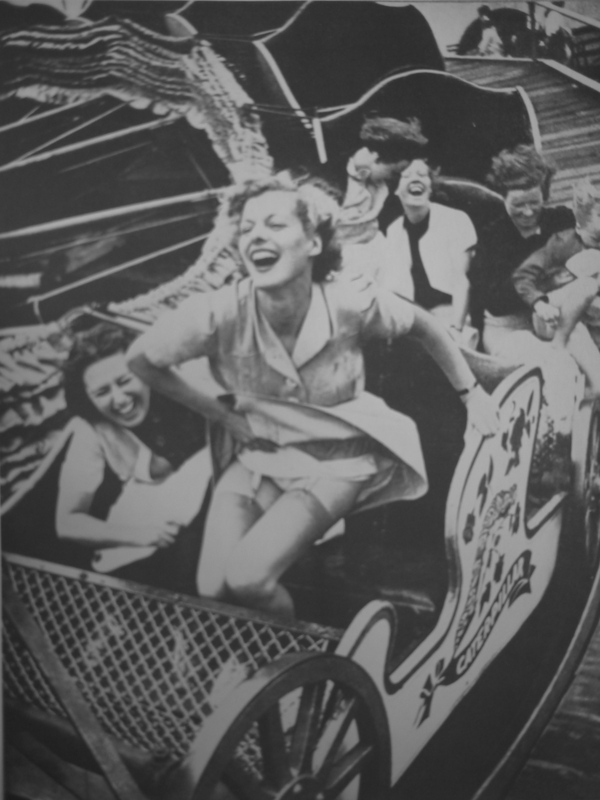 This photo taken at a state fair in 1938 by Kurt Hutton. I love how cheeky it is. The girl in her shirt dress, showing off her garters with a devil may care smile. All her friends laughing hysterically. The motion, the lack of crystal clear focus. It all conveys the fun, carefree spirit of summer. I think the time is significant too. America in the 1930s was a country in transition, trying to escape from the depression and dust bowl, not yet involved in the rumblings of WWII that were staring in Europe. There is a special innocence here that I think is something we all try to capture when summer rolls around. Hope you all have a great, carefree, and maybe even slightly naked holiday.